-Many upgrades already here – lots of crown molding/wainscoting/chair rail – custom kitchen roll outs, whole house humidifier, Celebrate Assessment paid in full to name just a few. -30,000 + sq. ft. club house – indoor/outdoor pools, gym, banquet room full time activities director. Additional Features and Amenities Come and live the Good Life in Celebrate. 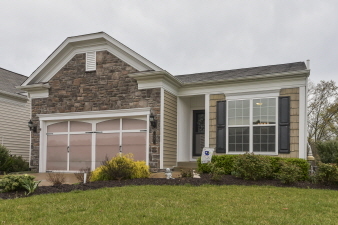 Welcome home to this 3 bedroom, 3 bathroom Madison Model. Enjoy time with friends and family out on the large back deck or lower level patio and take in the serene view. This lot is in a premier space and backs up to the trees for the ultimate in views and privacy. Back inside, the open floor plan is perfect for a more casual lifestyle. Enjoy easy entertaining and family time in the spacious family room, dining room, and kitchen. The cook in the family will appreciate the generous cabinet space and ample countertops in the well stocked kitchen with custom roll outs. Enjoy conversation with your guests as you cook because the kitchen opens right into the dining room and family room and is separated by a breakfast bar. The spacious family room is sure to please. The many windows let in so much natural light and show off that beautiful back view. The family room fireplace will keep you nice and cozy on cool nights.